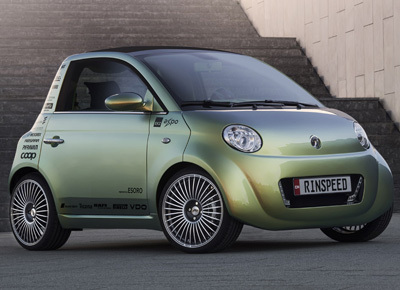 Home > Concept cars > Rinspeed UC? 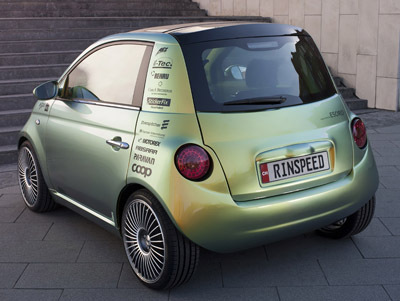 At the 2010 Geneva Motor Show, Rinspeed - the crazy Porsche tuning firm from Switzerland - unveiled the Rinspeed UC?. 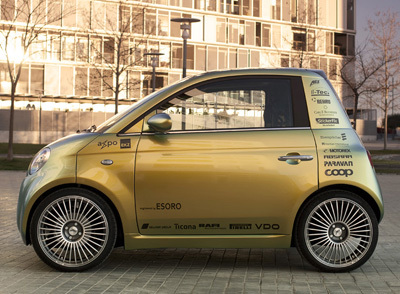 The name stands for 'Urban Commuter', and it is not just a proposal for a subcompact car, but also a specialized rail system to transport the electric powered cars between cities. According to Rinspeed, the goal is to create a new mobility concept that integrates individual car ownership and public transportation. A transverse loading system using custom railcars allows loading and unloading of numerous UC? vehicles simultaneously and in a very short time. Train passages are booked and reserved online directly from the vehicle. Integrated charging stations on board the custom railcars ensure that upon arrival at the destination the UC? 's battery is once again fully charged for maximum operating range. During the train trip drivers can visit the train restaurant, use any of the other train amenities or spend time in the privacy of their cars. The UC? 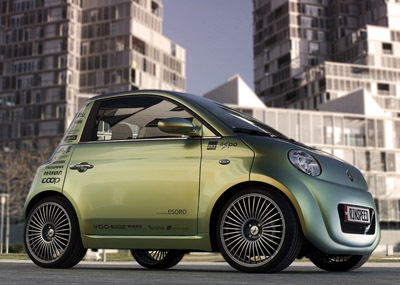 's electric drivetrain offers up 130 Nm of torque and can take the car up to a 75 mph (120 km/h) top speed. The range, not including any train transport, is 65 miles (105 km) thanks to a set of lithium-ion batteries. 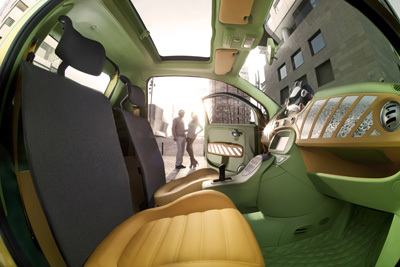 Inside the two-seat UC? 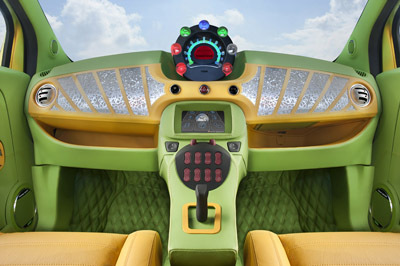 features a force-feedback joystick instead of a steering wheel. The drive-by-wire system has been designed to be intuitive and provide excellent steering feel and feedback. The Rinspeed UC? has been designed with several different versions in mind: The "Ultimate Commuter" is the comfortable lifestyle vehicle for urban commuters. The vehicle of choice for pizza deliveries, mail carriers and workmen in general will be the "Unlimited Commuter." The modular platform has been developed to help make the build process as cost and time efficient as possible.